We are pleased to say that a further meeting of the NICE Highly Specialised Technology (HST) Committee was held in Manchester yesterday about the Brineura treatment for CLN2. The meeting was attended by two patient experts who are both mothers of children on treatment and Harriet, our Family Support and Advocacy Partner, as well as representatives from the company, BioMarin, and the clinician conducting the clinical trial. There were other experts who attend the meetings at the request of the Committee. The last part of the meeting contains commercially confidential information and so the public and patient experts were not able to attend the whole meeting. However, a lot was discussed during the public part when everyone was present and some of the issues seem to be resolved. It is a complex treatment and the committee raised more questions during the meeting. The ‘mood’ of the meeting was serious, methodical and focused. Discussion was rigorous and targeted on getting the information the committee needs to make a decision. We will not know what the outcome of the meeting is for a few weeks. It is possible that further negotiations between BioMarin and NHS England will be necessary. We will keep everyone informed as we hear. We are very proud of our patient experts who gave their real life evidence with great composure and on behalf of all the parents of children with CLN2. It is a large responsibility but without them the process would not be complete and we are very grateful to them and the other experts who spoke for the treatment. 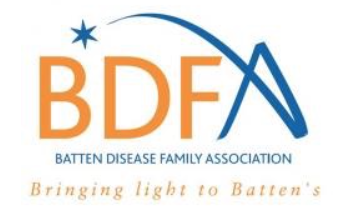 Everyone at the BDFA is grateful to your support over the process, especially those who signed the petition and raised the difficulties we have faced with those who could help. It has been – and still is – a joint effort and we are truly grateful.